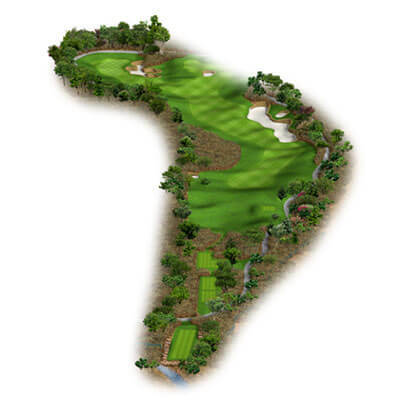 The Gary Player Course is an 18-hole, Par-72 course measuring 7654 yards from the Gold tees. 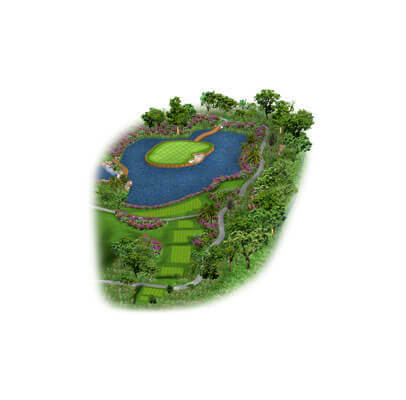 This signature design was fully opened in October 2015 and is the second course at the DLF Golf & Country Club. 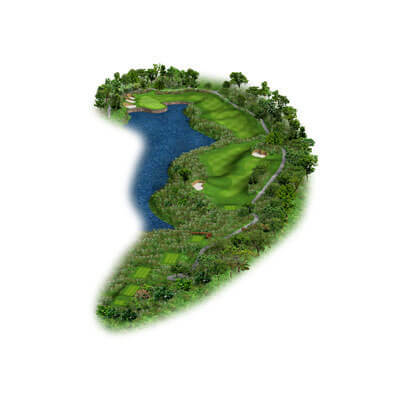 The course has two large lakes, big land forms, large undulating greens and unique style bunkering amongst its various features. 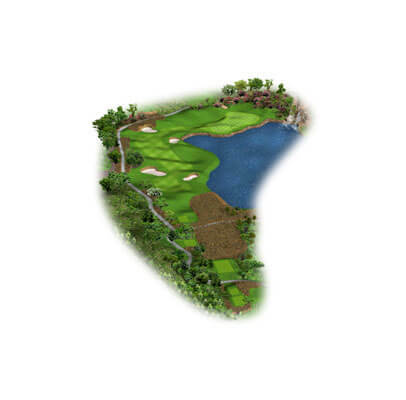 The front nine offers a par-3 with an island green while the closing holes are built around a quarry and a large lake with massive rock formations. Strategy is the key to successfully negotiating the course, which can play very different depending on the tees you play from. 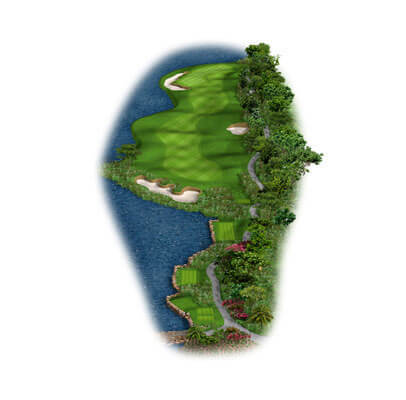 Golfers can choose to play from six different tees – Gold, Black, Blue, White, Red and Yellow. 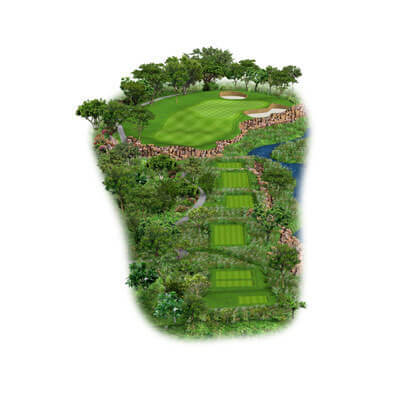 The Gary Player course has successfully hosted the Hero Women’s Indian Open in 2015, a Ladies European Tour event, amongst various other corporate golf events. This par-4 plays slightly uphill. The generous landing area is framed by two bunkers on either side of the fairway. The approach shot is to an elevated green that is protected by bunkers on the left & a gentle swale guarding the right. A gently contoured green is receptive, but sneaky contours will test your putting ability. This slight dogleg left hole provides ample room off the tee, but has a challenging approach shot. You have two green options here! The left green represents a slightly longer golf hole with more forgiveness around the green, although still quite challenging; while the right green is smaller & substantially elevated above the landing area and will test even the seasoned pro. 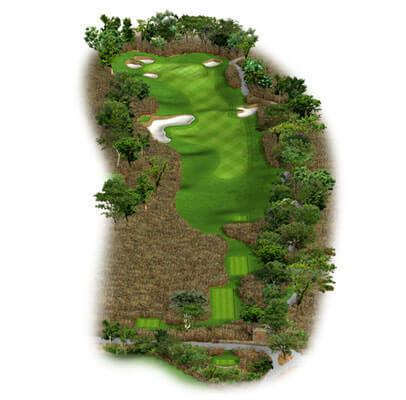 A long uphill par-3, this will require an accurate approach shot if birdie is to be considered. This well framed hole has a very contoured green. The safe play is to hit it to the front right of the green, avoiding the small but deep bunker protecting the front left. Take par on this hole and move on. The first par-5 on the golf course has a well-contoured fairway with two small pot bunkers guarding the left & a large meandering bunker that frames & defines the right. The 2nd shot is down a narrow avenue framed by trees that open up to a well guarded green protected by three bunkers. 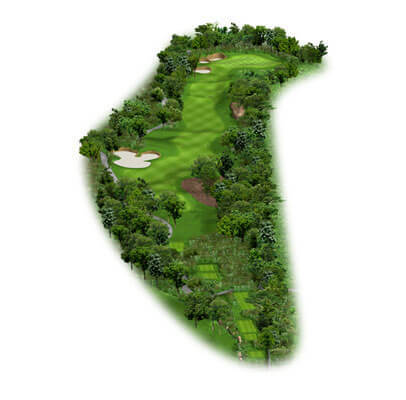 The green has three unique elevations defining each pinable area of the green. This exciting island green will certainly get your attention. A generous sized green with gentle contouring provides a relatively easy two-putt provided the approach shot is accurate enough to find the putting surface. While on the green, take in the beautiful vistas down the lake towards the number 8 green. Enjoy this majestic golf hole and setting, as this experience does not happen often. The first hole along the lake. Contouring partially hides the left of the landing area & the right side of the green. The landing area slopes generously from right to left. 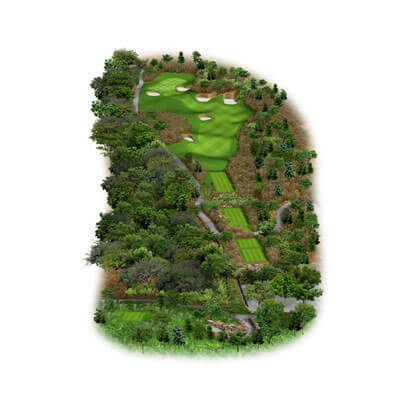 The green is long & narrow, perhaps a 3-club difference from front to back, so pick your club wisely. A long meandering bunker protects the left side while a large swale guards the right. A very tricky hole. 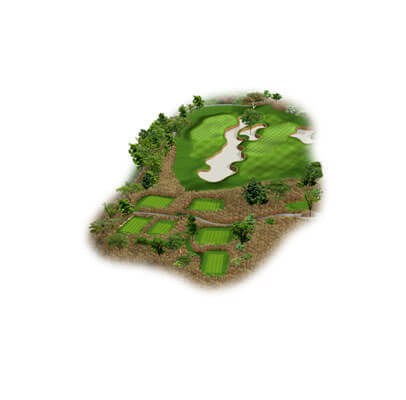 An uphill tee shot to a narrow landing area sets up a downhill shot to a severely contoured green. The green has a large grassy hollow that guards the entire front left. This hole may seem straight forward, but the little nuances on the tee & approach shot, combined with a challenging green will definitely test your abilities. A long par-5 with water along the entire right side. The tee shot is intimidating, as the fairway looks narrow. Two large bunkers are a backdrop to the second landing, but do not come into play unless you misjudge your shot. Go for it in two & you will definitely need accuracy. Strategically, the closer you keep your 2nd shot to the water’s edge the better angle into the green. A risk-reward hole. From the elevated tee you must make a critical decision how to play this strategically challenging golf hole. Four fairway bunkers guard the landing area while the lake lurks along the right side & in front of the green. 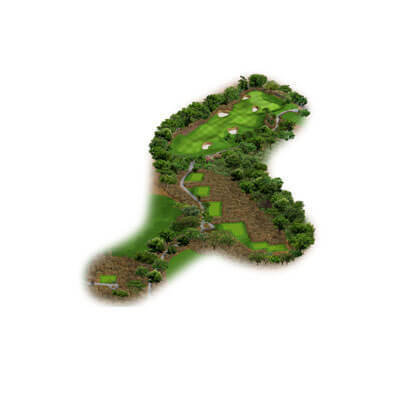 The green contours are demanding, so place your approach shot accurately if you want a viable chance at birdie. This uphill, dogleg right par-4 requires an accurate tee shot to maximize the view and angle into the small green. The approach shot is slightly elevated with a green that is partially blind. A gentle contoured green is receptive, but well protected by a large bunker on the left and native grasses on the right. 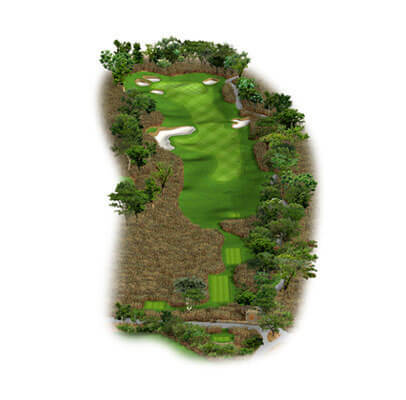 A short and sporty par-4 will certainly provide excitement and playing options. Play safe short or right and have a more challenging approach shot or take the risk to drive the green between the menacing greenside bunkers and contours. OB lurks along the left side so accuracy is a must. The green is highly contoured and will require accuracy for a realistic birdie putt. 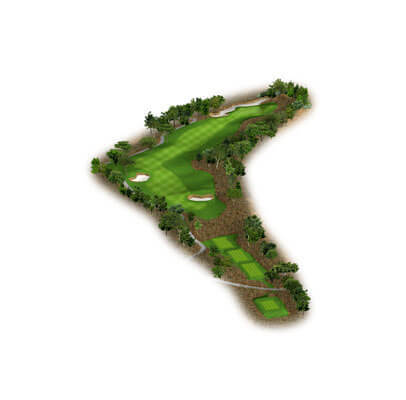 This medium length par-3 has two greens dissected by a large meandering bunker. The right green is large with three levels while the left green is small and gently contoured. Collection areas and bunkers protect the greens so be mindful of your club selection as wind will likely be a factor from the elevated tees. 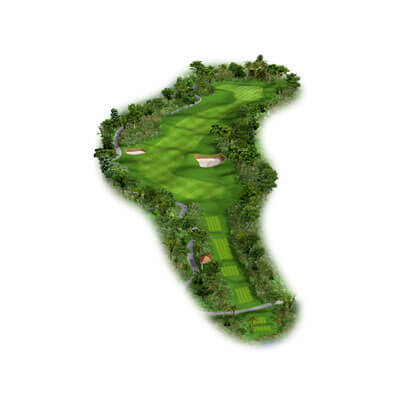 This short par-4 has a demanding tee shot to a narrow and well-protected fairway. Approaching the green from the fairway will be advantageous as this green is extremely contoured with multiple elevations, deflective contours and ‘sucker’ pin locations. 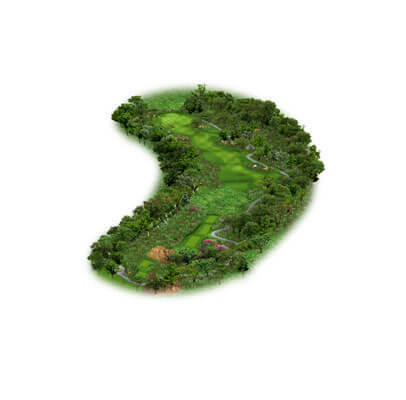 Don’t be greedy, take your par and go to the next hole. 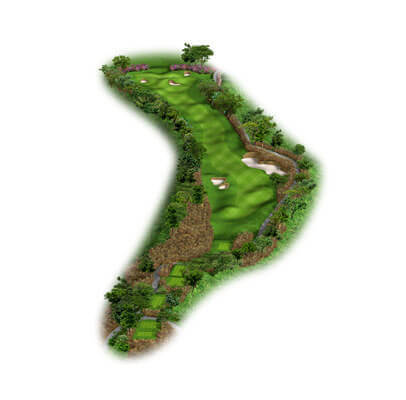 The longest par-4 on the golf course will certainly catch your attention. Two demanding shots will be required to reach the green. OB runs down the entire left side while strong contours & native grasses protect the right side. This green looks benign but is subtly tricky. Keep your approach shot toward the left side of the green, as the contours will feed the ball into the center. A long par-5. Play your tee shot toward the fairway bunker to get a better view of the green & second landing area. The fairway narrows as it approaches the green and OB runs down the entire right side of the hole. The right side of the green is blind while the left side is well protected by two large bunkers & strong contours. The putting surface is extremely undulating so a well-placed approach shot is a must. A monster par-3 playing downhill to a well protected green. 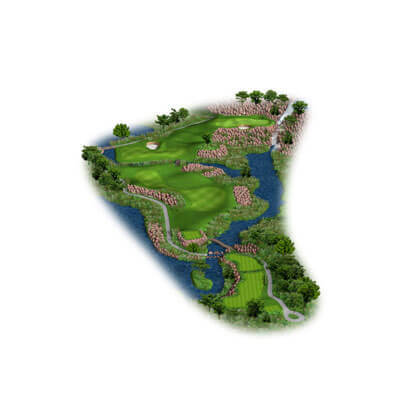 Players should aim to the left side of the green as contours will feed the ball into the center. Use the contours to your advantage and avoid the quarry at all costs. Club selection will be critical as the wind will likely be a factor from the elevated tees. Extreme visual drama and playing options will greet you on this par-4. Select the appropriate club off the tee to set up your approach shot to an uphill, blind putting surface. A very strategic & intimidating hole that requires a lot of thought and precise execution. A very dramatic and fun par-5. 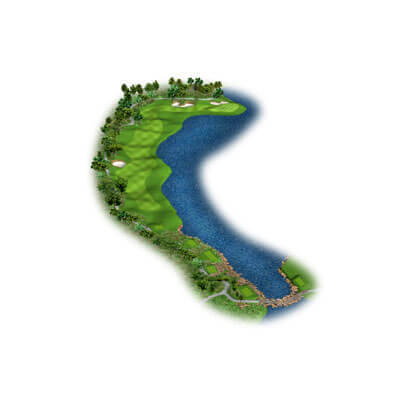 The key on this hole is to keep the ball in play and navigate around the large lake in the hope of making a par. The tee shot over the deep ravine is intimidating, but there is more room in the fairway than it appears. Once safely in the fairway, players must select the correct alignment for the next shot. The approach shot is to a large, but heavily contoured green with several distinct pin locations.